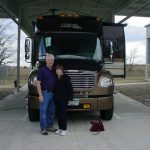 We have purchased several RVs in the past but this was by far the best experience as well as service we have had. Our salesman was great in the sales process of our DX3 and we like everything about it. Dynamax DX3 Super C RVs for Sale at Motor Home Specialist, the #1 Volume Selling Motor Home Dealer in the World as well as a full-line Dynamax RV Dealer. If luxury is a requirement and not well - a luxury - then the Dynamax DX3 is the motor coach for you. The minute you step into this coach you will experience luxury from beginning to end. In fact, the DX3 will exceed your expectations not only in its beauty but in its ability to stand the test of time. With the aerodynamic sidewalls and roof covering the frame of the Dynamax DX3 you will experience enhanced drivability while looking great at the same time. This coach is designed to give you the best comfort and value on the road with luxurious yet comfortable interiors and great exterior paint options. Inside, you will find hardwoods and soft and comfortable upholsteries as well as top-of-the-line appliances. The cherry cabinets run throughout the interior of the coach, and the available stainless steel refrigerator has a pull-out freezer as well as a water and ice dispenser. Who wants to work when they are on the road? No one that's who. With the Dynamax DX3, you can sit back and enjoy while this great motor coach does the work for you. From the available electric awning with LED lighting to the keyless entry door, this coach practically takes care of itself and you. You can also sit outside after a long day's drive and enjoy a little entertainment with the available exterior wall mounted entertainment center that includes a 32" LCD TV and CD/DVD with two speakers. Take the road by storm in your new Dynamax DX3 today and find out for yourself what sets this motor coach apart from the pack. You'll be glad you did, so don't wait. Also, look for used RVs at MHSRV.com or call 800-335-6054.